If you think the thought of head lice sounds disgusting, you’re not alone. 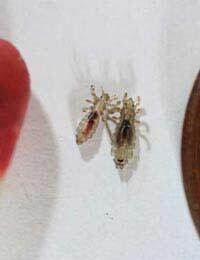 Lice (the singular is louse) are tiny insects about 2.5 millimetres long which lay eggs (called nits) in the human scalp, then continue to thrive by feeding off dry flakes of skin. Contrary to popular belief, people do not get lice because their hair is unwashed. In fact, lice are attracted to the human head regardless of whether the hair is dirty or clean, long or short. So poor hygiene does not beckon the little creatures – just being human does! Lice are spread easily as a result of person-to-person contact, which can include sharing combs, hairbrushes and hats, or simply sitting close to someone who has lice. Most children will get an infestation of lice at least once during their school years – and their siblings and parents might get them as well. There are hundreds of species of lice – although the ones that live on your scalp are a different species than pubic lice. Head lice, or Pediculus humanus corporis, have a lifespan of about a month, during which time the females lay eggs, or nits, on a daily basis, laying up to 10 in one go. The nits attach themselves firmly to hair strands using a gluey substance that makes them difficult to remove, then hatch as nymphs (which sounds nice but isn’t). They become full-fledged adults in about 10 days. Head lice cannot jump, but they still manage to get around from head to head easily. In some people they cause no real symptoms, while others are severely bothered, suffering from intense scratching and small bumps on the scalp, head, neck and occasionally ears. Special shampoos: Certain shampoos on the market contain pesticides that kill the lice, usually after you leave it on the scalp overnight. Simply wash your hair with the shampoo without rinsing it off, then wash out in the morning. Many people, however, are concerned about putting pesticides on children’s heads in particular, and the lice are now becoming pesticide-resistant in this country anyway. Wet combing method: This method is the safest way of getting rid of lice, but it can be extremely time-consuming. Wash your child’s hair with a tea tree oil shampoo, then add plenty of conditioner. While the conditioner is still on the air, comb it with a special nit comb which will catch both lice and nits. You will have to do this for at least a week daily to make sure they are all gone. Electronically charged combs: You might prefer to use an electric comb, which emits a tiny charge of electrical energy that kill the lice – and nits - on contact. Plan to use the comb several times at least to get rid of the entire infestation. Drowning method: Some pesticide-free shampoos are now available that claim to coat the lice and nits and effectively drown them away. Some people coat their children’s hair in mayonnaise, then have them sleep with a swimming cap on to have the same effect. Pubic Lice: Spread primarily by sexual contact, this infestation will make your pubic area itch intensely. If you have pubic lice, see your pharmacist for special anti-lice shampoo that will eradicate them, and avoid all sexual contact until you are sure they are completely gone. Hot wash all clothes and bedding. Check eyebrows and lashes for signs of lice as well, and apply a petroleum jelly there for at least a week if you find any. You may want to use an antihistamine or cream to make your life more bearable while they are still present. Body lice: Bigger than head lice, these creatures are also known as crabs and live in linen, clothes and furniture, and treatment is usually not required. What you will have to do, however, is to hot wash all pillows, blankets, sheets etc, Hoover all furniture (and throw away the bag) and check all family members for signs of body lice as well. Antihistamines can make the itching less severe until the infestation is gone. Nobody likes having head lice or nits, but the good news is that they are not a sign of poor hygiene. Still, they are itchy and unpleasant and most people want to get rid of them as soon as possible. Wet combing is perhaps the safest and most effective method of eradicating the beasts, but it will take dedication. And remember, the nits have a life cycle of about seven to ten days before they hatch, so you will need to comb again in a week once they are all gone.